Video players in virtual reality headsets aren’t exactly a new thing, but HTC’s brand new Vive Video might now be one of the most polished options available. Rather than just one kind of media, Vive Video supports 2D, 3D, 180-degree and 360-degree videos. When viewing in 2D you’ll be able to resize the screen to fill your entire field of view, or orient it so that it moves with you when you turn your head. Even more useful is the fact that it’s possible to move around in the 180-degree and 360-degree videos, as the HTC Vive’s positional sensors mean the video will adapt to your perspective. One of the best things about video players in virtual reality headsets is the fact that they can put you in a cinema environment without all the downsides of being in an actual cinema (sticky floors, phone screens with the light of a thousand suns, and suspicious chair stains being a few examples). 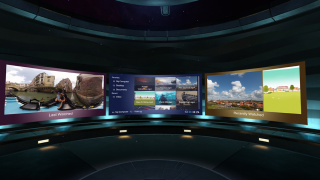 Vive Video even gives you the ability to customize this environment, in the sense that you have control over the size of the screen and the ambient lighting in your virtual environment. This isn’t the first virtual reality video player that’s been available for the Vive headset – there have been plenty of third-party apps, and even the Vive Home Cinema app – but this one from HTC Creative Labs looks like it’s a little more prepared for all the videos you might find yourself watching in virtual reality. Vive Video is now available from the Viveport app store, and each download includes a sneak peek of the INVASION! 360 VR video from Baobab Studios.